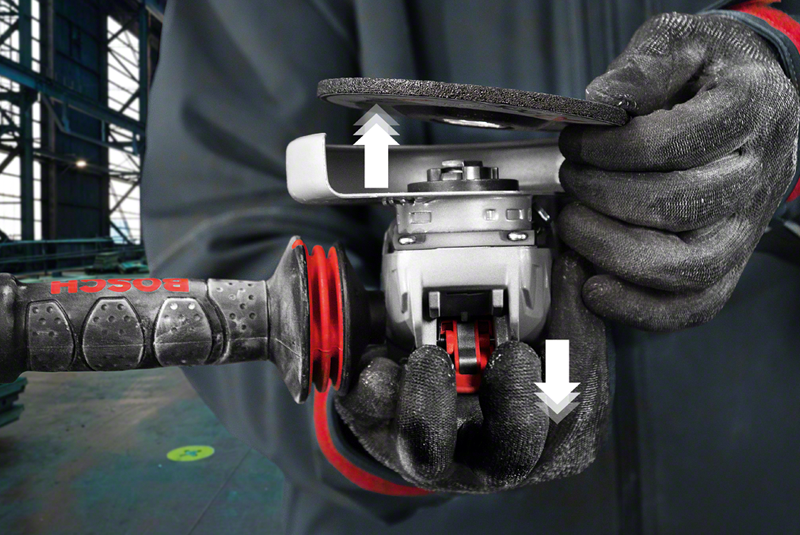 X-LOCK is described as the ultimate accessory-change system for grinders. One click is all you need. Bosch Professional has introduced what it describes as a revolution in convenience for angle grinder users with X-LOCK – said to be the fastest, simplest, most trouble-free accessory-change system ever. Launched at the same time as this game-changer are six small but powerful X-LOCK angle grinders, whose features will improve productivity, ergonomics and safety. Conventional accessory attachment involves a nut, a flange and a spanner, any of which can easily be lost – leading to downtime and frustration. X-LOCK, by contrast, is a genuinely tool-less alternative. Simply bring the accessory and grinder connecting surfaces into contact and press. A reassuring ‘click’ sound tells you they are firmly locked. To remove a disc, just flick a lever on the grinder. Changeovers can be completed in five seconds – which is five times faster than normal. You can even do it while wearing gloves. There’s no attachment nut to seize up on a jammed disc – or to get in your way when working at flat angles, or damage material surfaces. What’s more, X-LOCK indicates the right accessory mounting direction and won’t allow direction-specific accessories such as diamond cutting discs to be mounted incorrectly. The six small X-LOCK angle grinders comprise one corded model and five 18 V battery-powered cordless products. The cordless machines provide equivalent power to a 1000 W corded grinder. Compared to predecessors, they are up to 35% more powerful and give up to 100% longer runtime. Their ergonomic features include an intuitive user interface – showing tool status and enabling speed selection – and an inbuilt LED working light. They can also be fitted with a Bosch connectivity module which connects to your mobile device via Bluetooth for advanced functionality. Automatic safety systems on the new X-LOCK angle grinders include KickBack Control, which immediately shuts down power to the motor if the disc is suddenly jammed. Drop Control does the same as soon as a dropped tool hits the floor. In models with a PROtection Switch, power is instantly cut if the user lets go, while the X-Brake brings discs to a complete halt within one second of the tool stopping. Optional aids include Soft Start, allowing progressive build-up of speed to avoid initial kickbacks, and Restart Protection, preventing an unexpected start-up after a power cut or battery change. Auxiliary handles with vibration damping can also be specified. Bosch Professional angle grinders with the X-LOCK system, as well as an extensive range of accessories, will be available from May 2019 – with additional models following in future.